You have the choice of two different sizes polyethylene (PE) tubing: 3/4″ 100 PSI or the light weight 1/2″ 125 PSI. PE is perfect for beginner hoopers and the 3/4″ 100 PSI is especially great for fitness & exercise. Please let me know what you think about the newest HoopBunny Hoop design in the comments below! I am proud to announce that HoopBunny is again involved in a massive hula hoop giveaway put on by the Hula Hoop Shop Directory group on Facebook! This time there will be 39 prizes from 39 different hoop shops! 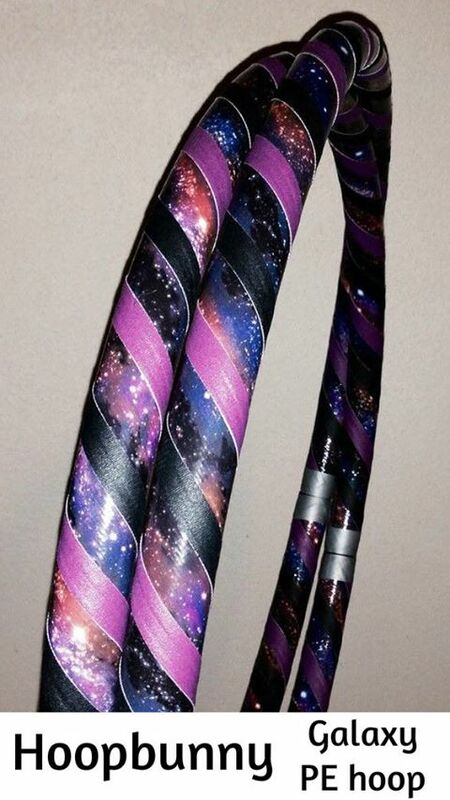 HoopBunny will be giving away a collapsible PE hoop featuring our most popular Galaxy design in any size the winner chooses. Keep reading for more details and how to enter to win! 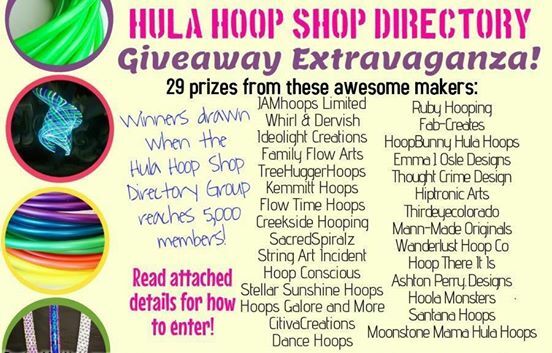 The time has finally arrived for the 2nd ever Hula Hoop Shop Directory Giveaway Extravaganza! 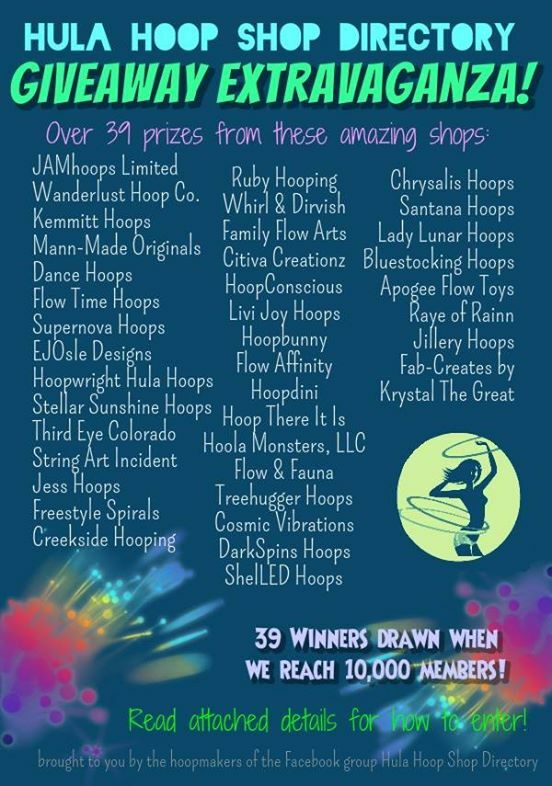 39 hoopmakers have teamed up to organize the largest hula hoop giveaway contest in history! Entering the contest is simple. First you need to make sure you are a member of the Hula Hoop Shop Directory group! Next, you must follow this link to enter the official contest. When the group reaches 10,000 members, we will randomly generate 39 winners from the contest entries! While the contest website will only require you to visit each page in order to be entered, we will be verifying that the winners we draw have liked all of the below pages! The contest website will guide you to each of these pages. The below list is just for your reference. Share this flyer with all your friends to get us to 10,000 members fast!!! HAVE FUN AND GOOD LUCK!!!!!!!!!!!!!!!! 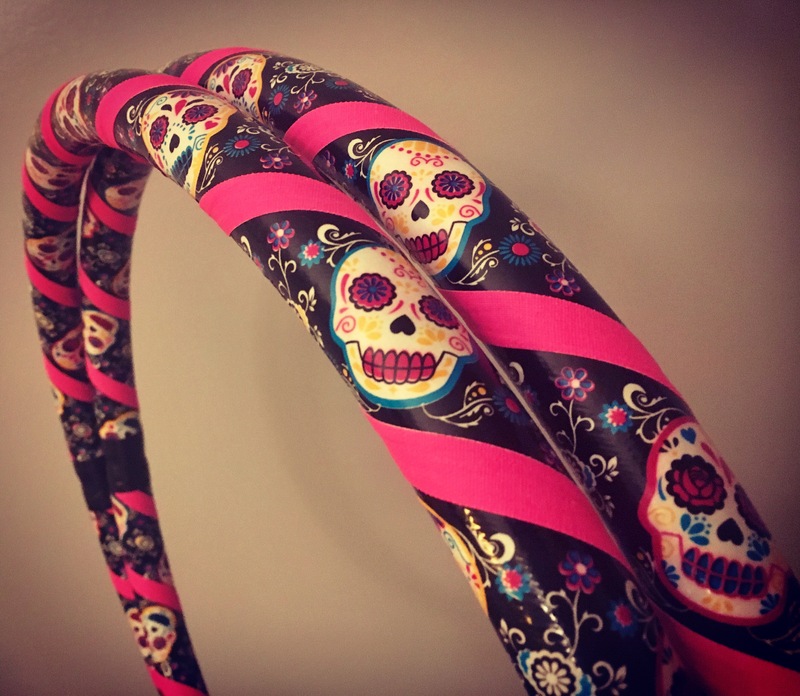 It has been a while since I have released any new hula hoop designs, but I recently added 4 new listings to the HoopBunny Hula Hoops Etsy shop for new hoops! Check them out! Let me know in the comments which new hoop design is your favorite! 29 hoopmakers have teamed up to organize the LARGEST HULA HOOP GIVEAWAY CONTEST in history! group reaches 5,000 members, we will randomly generate 29 winning members! Share this flyer with all your friends to get us to 5,000 members fast!!! Thank you to everyone who entered the “How I Started Hooping” hula hoop giveaway! I loved reading everyone’s stories about how they were introduced to the world of hooping! They were all so fun and inspiring! I will make another post with all the stories I received soon so you can all be inspired and share the hoop love. There were about 200 entries for this hoop giveaway so I numbered each entry and used a random number generator to choose the winner. The number chosen was lucky number 34, Danielle McCormick! Congratulations Danielle and thank you for submitting your story & supporting HoopBunny!! Please send an email with your choice of hula hoop (including colors & size) and your mailing address to HoopBunny@gmail.com. You can choose one from the HoopBunny Etsy shop or any combo of tapes that you see at the shop as well. For everyone who entered the giveaway, you can use coupon code ThankYou15 for 15% off a purchase at the HoopBunny shop from now until July 1st! About 4 years ago, I was spending time with a few of my girl friends and found out that my best friend had NEVER owned, nor hula hooped in her life. I actually thought back to my childhood and how simple it was to disappear from the world with a simple plastic ring. We made a late night trip to WalMart and purchased the cheap, horrid taped/sticker/glittery hula hoops. It was fun trying to remember how to do it myself and then teach someone the basic motions. She fell in love and began hooping on her own, making her collection grow to professional grade hoops. I had unfortunately stopped messing around with the hoop(s) due to personal life changes and distractions, until recently. I picked my simple hoop back up a few months ago after some stressful events. It gives me an escape and it’s great exercise. I have a few friends that hoop/gogo for shows, and watching them flow/escape is simply gorgeous. They give me a goal to obtain. I’m still a “basic” hooper, currently, but I see that changing in the months to come.